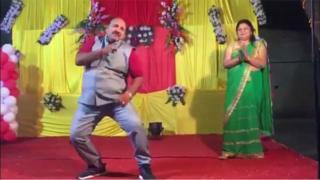 An Indian electronics professor, whose dancing at a wedding has gone viral, says he has been overwhelmed by all of the attention and hasn't been able to rest or talk to his children since. "I could never imagine that I'd become famous for my dance moves," Sanjeev Srivastava told the BBC. Celebrities took to social media to applaud his moves, which featured on local television over the weekend. His Twitter account, only four days old, has got nearly 3,000 followers. Mr Srivastava, who is 46 years old, said he has "no idea" how the video of him and his wife dancing went viral, adding that it was shot by a relative at a recent family wedding. Indian Twitter has even crowned him with the hashtag #dancinguncle - which started trending on Saturday. While he is not a dancer by profession, the dancing bug hit him when he was a child. At 10 years old, he took part in - and won - his first ever dancing competition. Growing up in the central state of Madhya Pradesh, he participated in three other competitions - winning trophies in all of them. Now he has been appointed as a brand ambassador of his hometown municipality. The original 80s song features Bollywood actor Govinda, who is known for his jaunty dance moves. The actor has also commented on the video, saying he "loves his moves". Other Indian celebrities, including actors Arjun Kapoor and Anushka Sharma, also took to social media to compliment Mr Srivastava. "Some relatives uploaded it on Facebook and it took off. The media picked it up - I haven't been able to rest over the past four days," Mr Srivastava told the BBC. He said his schedule has been quite busy ever since the video of him and his wife dancing to the Bollywood hit debuted on social media. They have been interviewed by various local channels and have even performed the dance routine on live television. This video has been widely shared across all social media platforms in India, but Mr Srivastava says that he doesn't usually keep any videos himself. He had even quit dancing on a regular basis, but added that he still makes time for it when the occasion arises. "I dance with my children at home every Sunday to keep in touch with it," he said.